Gas ranges are quite popular in today’s kitchen, both residential and commercial. Despite having been in the market since 1836, this cooking device is still a crowd puller for various reasons. One, it can be used anywhere including remote areas or where there is no grid connection. Two, it produces a blistering flame that can heat most cooking appliances including cast iron, aluminum, stainless steel, copper-bottomed and more. Three, the flame is effective for flat as well as rounded appliances such as works. Many types and brands have been introduced into the market. While this broadens consumer choice, making the right decision first time can be difficult. We took a peek the top 10 best gas ranges in 2019 that is suited for both commercial and domestic applications. Size: Gas ranges come in diameters of between 30 and 36 inches. Wider types are mainly used in commercial applications while smaller ones are for domestic application. Type: Freestanding and Slide-In are the common choices people have. The former is bulkier and is used as it is while the latter can be customized to suit a space. Design: it’s essential to look at the design and location of the control knobs. Good choices are well-designed and come with well-placed knobs that won’t interfere with functionality. Capacity: The need at hand determines the range’s capacity. People who normally bake will require a larger capacity compared to those who prepare simple meals that don’t require the use of the oven. Small units have a 2 cubic feet capacity while large ones can be 4 cubic feet. Cleaning ease: A good accessory is made from quality material and comes with a smooth surface. It won’t easily get stained or require too much effort to wash-up any food spills. It also features a recessed pan for trapping liquids. This 36-inch gas range is perfect for people looking for a professional piece. 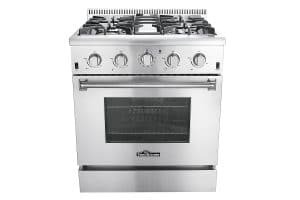 The stainless steel unit comes w with 6 top burners; one 18,000 BTU, two 15, 000 BTU and three 12,000 BTU. It also features a 12,000 BTU convection burner, 16,500 BTU infrared broilers, and a 5.2 cu.ft oven. 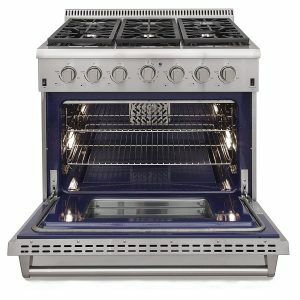 The unit comes with electric ignition, high-quality knobs, blue porcelain interior, and 100% stainless steel side panels. 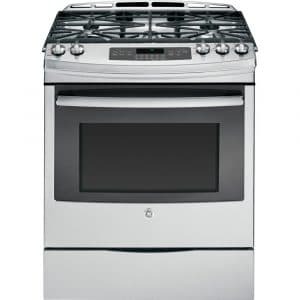 The OneStop GE PGS950SEFSS gas range comes in a 30-inch profile and is fit for domestic use. It is made quality stainless steel that provides durability and is also easy to clean. The Slide-In design allows it to fit even in small spaces and can also be customized to match unique desires. 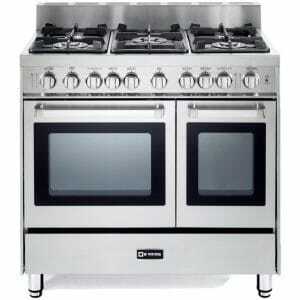 It comes with sealed self-cleaning burner double oven and has heat range from 5000 to 17,000 BTU. 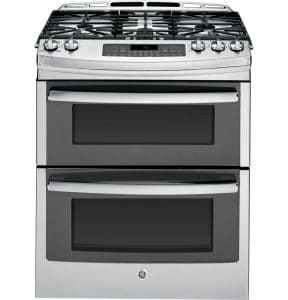 Shoppers searching for a simple yet dependable gas range should think about the GE JGS750SEFSS. Like most top products, this 30-inch unit is also made from quality stainless steel and will resist regular use, bangs, knocks or hits. It features a smooth surface that is easy to clean and won’t be stained by food spills. The unit features 5 burners with the lowest producing 5, 000 BTU while the highest is 17, 000 BTU. 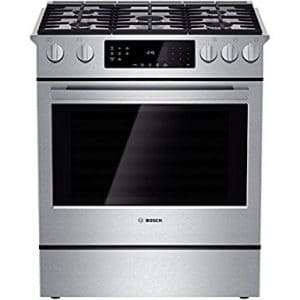 Consisting of 5 sealed burners, the 30-inch Samsung NX58H9500WS gas range can be used for domestic and commercial use. It is made from premium quality stainless steel, comes with a 5.8 cu. ft capacity, and is based on True Convention. The 202-pound unit also includes friendly guiding control lights, temperature probe and measures 26.4 x 29.8 x 37.2 inches. The AVANTI GR2415CB is a freestanding gas range designed for domestic use. The 24-inch unit is loved for its elegant styling and simplicity that makes using and maintaining it easy. It measures 25 inches deep, 23.5 inches wide and 40.75 inches high and weighs about 104 pounds. 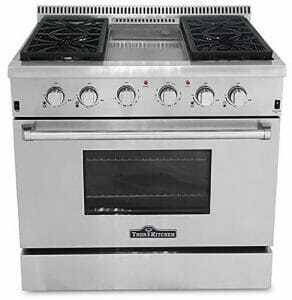 The accessory features automatic electronic ignition, 61 minute timer, see-thru glass oven, and has a 2.6 cubic feet capacity. This Freestanding 36-inch gas range by Thor Kitchen consists of 5 burners and 5.2 cu. Ft high powered oven The stainless steel unit is ideal for preparing a range of dishes courtesy of the 18,000 BTU Infrared middle griddle, two 15,000 BTU burners, and two 12,000 BTU burners. The convection oven is rated 22,000 BTU. For easy cleaning and minimizing stains, the gas range boosts of a smooth exterior. This 30-inch gas range scores well in design, reliability, and functionality. It is constructed from strong and easy to clean stainless steel. The unit features 5 burners with the highest burner placed at the center and produces 18, 000 BTU. The unit includes a 4.6 cu. Ft oven, 9 cooking modes, and True Convection. 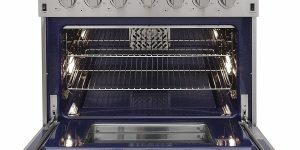 The 255 pound, 33 x 34 x 40-inch gas range comes with Pyrolytic Self-Cleaning. The 36-inch Verona VEFSGG365NDSS professional gas range comprises of 5 sealed burners, 2 turbo-electric convection oven, and the infrared broiler. The stainless steel item is made from stainless steel and suitable for home, restaurant and other places and includes storage drawers. It comes with durable and easy-clean porcelainized caps and cast-iron grates. And to help you achieve amazing results, it features a bell timer and convection fan system. The Thor Kitchen HG18054UC is freestanding and delivers professional results. The 30-inch unit is crafted from stainless steel and includes cast iron grates. It features 4 burners with the highest rated being 18,000 BTU while two generate 12,000 BTU and the other is 15,000 BTU. 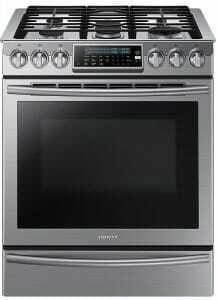 The gas range also has a 22,000 BTU convection oven and easy-to-clean porcelain oven interior. 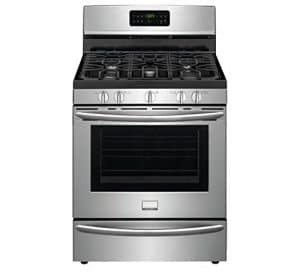 The Frigidaire Gallery 30-inch gas range is suitable for various cooking application including boiling, steaming, and baking. It is made of high quality smudge-proof stainless steel and features continuous corner-to-corner grates. The Freestanding Gas Range comes with Quick Bake Convection for faster baking and Power burner for speedy boiling. The One-Touch Quick Self-Clean saves you the burden of cleaning the oven all the time. 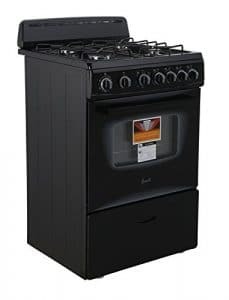 Finding the best gas range for your home, restaurant or any other situation will be easier if you follow the above review of the top 10 best gas ranges in 2019. Our focus was on reliability, functionality, user-friendliness, and efficiency, cost and consumer opinions. The featured items get praise for their versatility and suitability for use in preparing different meals, easy to use courtesy of the well-sized and placed knobs, easy to clean and maintain, and adequate size and capacity. The gas ranges are also backed by positive reviews from consumers and reviewers and can easily be bought via amazon.com.